Dr. Marshall Hall is a Director of Jamaica Producers Group Limited, where he served as Group Managing Director for over 25 years. 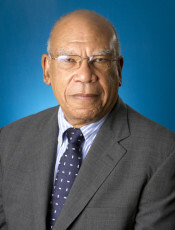 Dr. Hall has been an academic economist and has served as Professor and Chairman of the Department of Management Studies (now the Mona School of Business) as well as Dean of the Faculty of Social Sciences at the University of the West Indies. He has also been a Professor at the University of Wisconsin in Madison Wisconsin, Washington University in St. Louis, Missouri and Makerere University in Kampala, Uganda. He has held numerous corporate directorships and served as board chairman in a wide range of institutions in the public, private, academic and non-profit sectors in Jamaica and internationally. He is also a member of the PSOJ Hall of Fame and has been awarded the Order of Distinction in the Rank of Commander (CD) and the Order of Jamaica (OJ) by the Government of Jamaica. Dr. Hall holds a Bachelor’s Degree from the Colombia University and a PhD from the University of Wisconsin.